You can’t go wrong with chips and salsa, but when we want to go all-out, we whip up this super creamy queso dip. 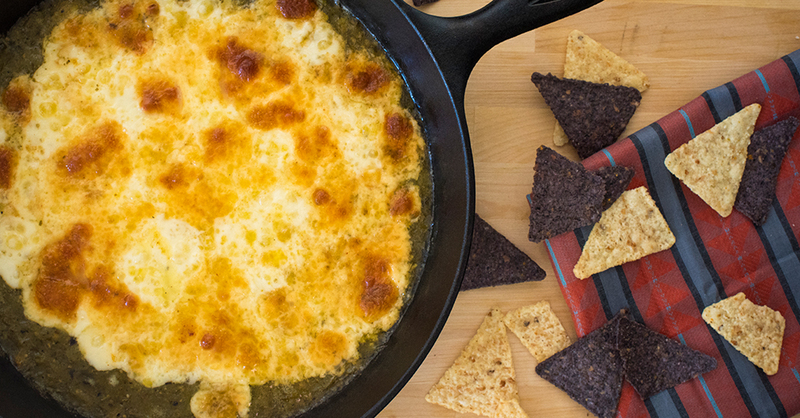 The melty cheese and juicy tomatillo sauce is a perfect pairing with crunchy tortilla chips. We love being able to customize the heat level to our guests’ tastes, especially if there are little ones around! It comes together in a flash, and is a huge hit at any get-together – from game night to Cinco de Mayo fiestas. This stuff always disappears in no time, you may need to make a double batch! Preheat oven to broil (if you have two settings, set it to low), and place rack in the second highest position. In a large bowl, mix together tomatillo sauce, green chiles and lime juice until combined. Drizzle olive oil into oven-proof skillet, then make a short pile of cheese cubes in the center of pan. Carefully pour tomatillo chile mixture in a circle around the edge of cubed cheese. Place skillet in oven and broil for 5-7 minutes, or until cheese is bubbly and starting to brown. Remove from oven and let cool 5 minutes, then garnish with cilantro and green onions, and serve with tortilla chips.